A magnitude 7.7-7.8 earthquake hit Pakistan today with an epicenter at about 15 km depth. It was well inside the borders of Pakistan and far from the ocean. Although only a few dozen (46) casualties have been reported as I write this (10:00 p.m. Central Time), the location of the quake is remote and it is likely that casualties will rise, with some estimates being in the thousands (WAPMERR, The World Agency of Planetary Monitoring and Earthquake Risk Reduction). As this unfolds, an intriguing observation with speculations has hit the news--a mysterious island has risen from the ocean. It is reported to be 20-40 feet high and about 100 feet wide and lies about 350 feet out in the sea from the Gwadar coast (these numbers are very tentative--one report says that it's a mile out to sea, which seems more consistent with the picture that I've included above). It appears to be several hundred miles from the epicenter. Residents of Gwadar have reported that an earthquake in 1968 produced an island that remained for about a year before vanishing (but it's reported also to have occurred in the 1940's so I don't know if this is an inconsistency in historical reporting or if it has happened more than once). What could have caused this mysterious phenomenon? Speculation at the moment is our old culprit, liquefaction--the sudden transformation of wet, but solid, sediments to a weak mush upon shaking, just like jiggling quicksand turns it to a mush (for more on liquefaction and the general phenomena discussed here, see my book "The Dynamics of Disaster" to be released by Norton Press on October 21!!). When this happens, structures such as buildings can sink into the ground because it can no longer support their weight. The liquified material can also squirt up through cracks in the ground forming sand- or mud-volcanoes, and the speculation here is that the island is a big mud volcano. Sometimes these mud islands appear in places that others have appeared before. One, called Malan island, appeared in 1999, unaccompanied by any noticeable earthquake, reoccupying a site of one that had been formed in 1945. It appears to have been driven by methane of bacterial origin. One of the largest reported mud volcanoes is a complex 100-m high. It has been hanging around since at least 1840 and appears not to have changed much in the intervening decades. Methane of bacterial origin is persistently discharged into its crater mud lake. Eruptions of these gases often show periodicities of several hours that may be related to ocean tides. I'm not sure how the dating is done, but the article * below says that the presence of mud volcano activity in this region can be demonstrated for the last 460,000 years. *G. Delisle, "The mud volcanoes of Pakistan," Environmental Geology, 46: 1024-1029, 2004. Super Typhoon Usagi nears Philippines. What is a super typhoon? Hurricanes Ingrid and Manuel pummel Mexico; Hurricane Humberto in the Atlantic has become a ghost of its former self, and now Super Typhoon Usagi is targeting the Philippines and Taiwan. It is expected to become merely a severe typhoon when it hits China, right at Hong Kong. Usagi has a diameter of more than 1000 kilometers. It has eclipsed Super Typhoon Utor, which was the strongest storm of the year so far. On Thursday evening, its minimum pressure was very low, 882 mb, which makes it the "deepest and most intense storm to exist on Earth since 1984 (tied with Wilma in 2005)" (quote from The Washington Post). As of Friday at 1:30 p.m. Pacific Time, the eyewall had undergone a replacement and winds have peaked in intensity, but the cyclone is still a very dangerous storm. It will weaken as it hits Taiwan, but is still expected to have winds near 100 mph when it hits Hong Kong (likely on Sunday, right when a major autumn festival is going on). The past two decades, cyclone activity in the South China Sea has been relatively calm, and there are some forecasters worried that the population may "wrongly think that the typhoon risk in Hong Kong has declined." In 1906 and 1937 typhoons killed 15,000 and 11,000 people respectively, but with better warning systems, there have been less than two dozen casualties since the late 70's. A "super typhoon" is defined as a storm that reaches maximum sustained winds of at least 65 m/s (234 km/hour), so it is equivalent to a Category 4-5 cyclone. The term "major hurricane" is also used, and it is used for storms that have maximum sustained 1-minute surface winds of at least 50 m/s or 180 km/hour, so applies to Category 3 storms and stronger. According to the National Weather Service, as of 8:20 a.m. this morning, Boulder has received 9.64 inches of rain this month, breaking the old record of 5.50 inches set back in 1940. Most of this rain fell overnight. The heavy rain resulted from warm moist air flowing in from the south colliding with cool moist air coming from the north and east. The pattern is expected to continue through the end of the week. According to the National Weather Service, the "southwest monsoons" usually begin around the second week of July when an area of high pressure breaks away from the main Pacific ridge and settles in over the Great Basin, bringing hot temperatures during June and early July. This high center moves eastward across the Continental Divide and into the Central Plains (more or less what you see in the graphic above), followed by a slightly cooler but very moist environment brought in by southwesterly flow behind the high. The monsoon is typically over by the end of August, but can continue as late as October. To quote the NWS site "In fact, many areas in southwest Colorado and southeast Utah experience a secondary precipitation maximum in October due to late-season tropical storm moisture that's been carried northward by the monsoonal flow." The monsoon moisture does not produce thunderstorms every day, but has a pattern of "bursts" and "breaks." A "burst" is a movement of a weak trough into the upper level westerly winds. It spreads upper level cold air into the region. Meanwhile, the lower levels of the atmosphere experience strong surface heating and transport of moisture from the southwest. These two conditions create a very unstable atmosphere, leading to widespread thunderstorm outbreaks. A "break" occurs when an enhanced ridge of the Pacific subtropical high pressure moves inland and cuts off the moisture flow, thus stabilizing the atmosphere. The monsoons are welcomed because they offer a break from accumulating hot days in June, but they also result in deadly flash floods. As I write this (3:00 PDT) flooding is leading to evacuations in Denver, I-225, I-270, I-70 and I-25 all are experiencing flooding and traffic jams, CU Boulder is closed today and tomorrow, and 5 dams are overtopping or burst. A life-threatening flood emergency has been in effect in Boulder and northern Jefferson counties since last midnight. Three people have been killed due to flooding, and lengthy flash flood warnings and watches are in place. "The Big Problem with Disaster Planning"
Back in action after a much needed summer break! We know that a tornado will bring howling winds and drenching rain, that a volcanic eruption will blanket the countryside with ash or lava, and that an earthquake will violently shake the ground. These are some ways in which Mother Nature unleashes the energy stored in the earth, and we can try to anticipate and prepare for the results. We can build basements and shelters to protect us from those tornadic winds, flee from the countryside when the volcano erupts, and reinforce our infrastructure from the quaking ground. But we have not always anticipated the chain reactions that these natural disasters often trigger. The tornadic winds in Moore, Okla., last week and in Joplin, Mo., only two years ago killed many victims by blunt force trauma, but people also died from less direct causes. In Moore, it appears that at least six children, who should have been safe in a basement, died from asphyxiation when water, possibly from broken pipes, flooded to the low point where they were sheltered. Several people in Joplin died from a rare and difficult-to-treat fungal infection called zygomycosis. It turns out that people who have sustained massive traumatic injuries become so stressed that their immune systems find it difficult to fight off infections, paving the way for pathogens to enter the body and thrive. It took teams of experts from the local, state and federal level to figure out that the people who were displaying these symptoms had been impaled during the tornado by projectiles containing soil, and that the infections arose from a fungus in the soil. In the harbor of Port-au-Prince, Haiti, much of the damage from the 2010 earthquake was not from direct shaking, but from the fact that the solid ground supporting the wharfs turned to mush during the quake, a process known as liquefaction. This, in turn, closed the harbor to rescue efforts to bring aid into the area. The same process caused multistory buildings in San Francisco to sink up to their second or third floors in the Loma Prieta earthquake. And in the classic historic example of the eruption of the Icelandic volcano, Laki, in 1783, the tens of thousands of people who died as a result were mainly the victims of famine. Although the eruption was relatively small (a 6 on a volcanic scale of 8), the volcano spewed out around 8 million tons of hydrogen fluoride and 120 million tons of sulfur dioxide over an eight-month period. Half the cattle, 80% of the sheep and 20% of the people of Iceland died in the event now known as the “Mist Hardships.” The sulfurous clouds spread across Europe and around the world, weather patterns changed, crops failed and the deadly famines developed. If we want to improve our odds of surviving disaster, we need to do two things. First, we need to be prepared for the rarest, biggest events. Currently we invest in infrastructure to protect us from the smaller events — be they tornados, eruptions, earthquakes or even small tsunamis that can be shut out by common storm wave barriers on exposed coastlines. But, we rarely have made the costly investments necessary to protect us from the rare, but truly devastating, big events. Second, we need to learn much more about the secondary reactions and raise more awareness that it’s not just the primary disaster we have to anticipate. In order to enhance public safety, civic leaders and emergency responders as well as members of the general public must understand the links in the chain. By improving our emergency-response system and educating the public so that people are willing to support such efforts, we can greatly improve our readiness for the next inevitable outburst of Mother Nature. 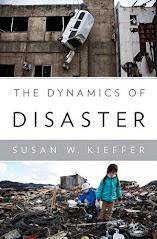 Kieffer is a professor emerita of geology and physics at the University of Illinois at Urbana-Champaign and the recipient of a MacArthur Fellowship. She is the author of the forthcoming book Dynamics of Disaster and writes regularly on her blog Geology in Motion.